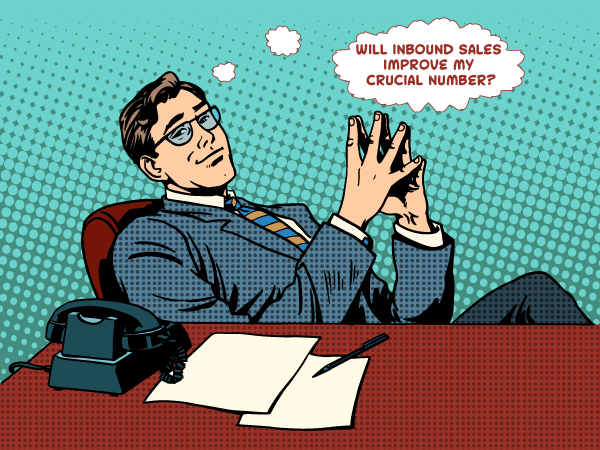 Is Your Company Ready for Inbound Sales? Inbound Sales requires companies to know their Crucial Number—what it cost to acquire a new customer. Otherwise you’re trying to optimize something that isn’t measurable. That’s a waste of time. More on this in a minute. Recently, I wrote about how important it is to know your Crucial Number. Some of you may be wondering if it’s worth the effort. “My Crucial Number is $834.” So what? Is that good or bad? What's a new customer worth to you? Suppose an average customer has a lifetime value of $80,000. If it only cost you $834 to get this customer, do it again as early and often as you can! If an average customer lifetime value is $8,000, then $834 may still be good as long as you have decent margins and a predictable sales process. If a new customer only brings you $600, you’ve clearly got a big problem and need to make some major changes. What does this have to do with Inbound Sales? After we help clients determine their Crucial Number, the next step is usually to document their sales process and analyze each step. You can think of the overall marketing and sales process like an oil refinery. In the beginning you start with crude prospects that barely seem like potential customers. Then, you warm them up and filter them to see which ones are qualified and are good fits. After a while, sales starts working the leads. There’s more filtering as the relationship builds. At the end, refined customers are the result—the jet fuel that propels your company. Here’s what you may not have considered. Each step in the process adds value. The further you go into the process the more expensive it is to lose a customer. We frequently see that there’s a gap in the handoff from marketing to sales. Marketing worked hard and spent $200 or more to get the lead. Then it goes nowhere. I can hear some of our sales readers screaming, “That’s because the leads are lousy.” Maybe so. Or, it could be that key steps are missing and marketing is passing off the leads too soon. Or … The handoff creates a disconnect for the buyer. This is a big problem—especially for companies that have been investing in Inbound Marketing. Inbound marketing is very friendly, educational, and buyer-focused. What happens too often is that information learned during the marketing phase does not get passed through or used by sales. The buyer exits the marketing phase feeling like they know the company and the company knows them. Then, the salesperson starts asking repetitive, basic questions all over again and doesn’t seem as helpful. It breaks the relationship and feels wrong for the buyer. Do you know your Crucial Number—the cost to acquire a new customer? Have you laid out your sales process? Do you need to add steps or content to have a smooth transition from marketing to sales? Are your salespeople trained and expected to maintain the helpful vibe you created through Inbound Marketing? It’s all about creating new customers who love your company and can’t wait to buy again. Do this efficiently and smoothly, and you’ll have a low Crucial Number and a thriving company. If you want to review how all this applies to your company, schedule a Crucial Number review. We’ll focus exclusively on your crucial number, sales process and opportunities to unblock your growth.